When we say the “real estate market” we’re really talking about four distinct but somewhat inter-related components: housing sales (and values), housing finance, commercial real estate (starts, occupancy, etc. ), and commercial finance. Each of these components has plenty of sub-groupings. For example, commercial apartment development is going well, although commercial apartment finance still has some problems. Housing development finance is on life support. Many aspects of commercial development (e.g. – hotels) are moribund. I’ll start today with the most significant problem in the housing sector — the one which may take the longest to fix — and that’s housing starts. The market is worse than it’s been since we’ve been tracking data (40+ years) and certainly the worst in my experience. 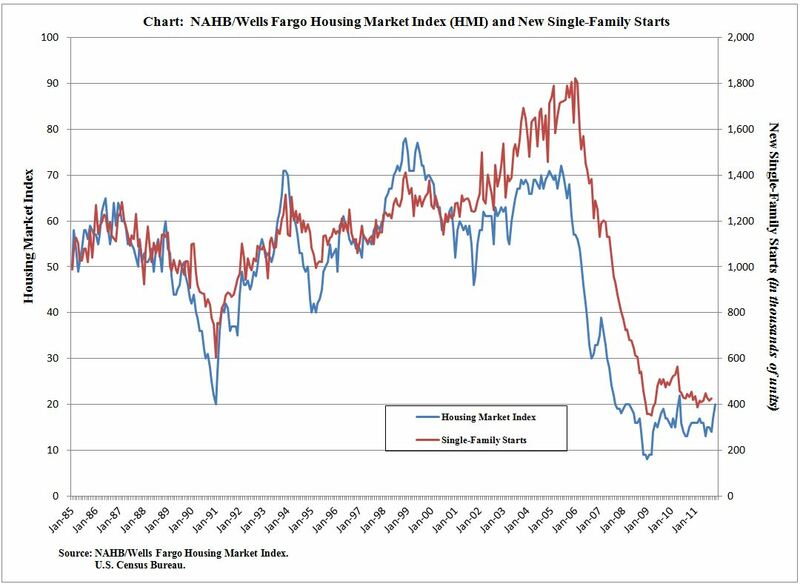 The attached graphic comes from the National Association of Homebuilders, and shows their tracking of both housing starts as well as the NAHB/Wells Fargo Housing Market Index (HMI). As you can see, back during a period of relative housing stability (1985 – 2005), housing starts generally cycled between 1 million and 1.4 millin per year. With the bubble in home ownership rates, starts got up to 1.8 million for a short period then collapsed. More interestingly is the period between 1989 and 1993, when home starts dipped to about 600,000 per year, then rapidly bounced back to a healthy level. That was a period marked by real problems with acquisition, development and construction (ADC) loans, but the underlying demand and value equations still held firm. Thus, when the market cleared (when demand sapped up any supply overhang), the homebuilding community was ready to go back to work. Today, it’s VERY different. ADC lending is still nearly non-existent (compared to a half-decade ago). The decline in values means that in many markets, it’s difficult to build a home for less than the selling prices. Further, the permanent lending market is also problematic. A big chunk of homebuilding is the “move-up” market, with a secondary chunk in the vacation or second-home market. Down payments for “move-ups” and second-homes traditionally come from equity in existing homes. However, a substantial proportion of homes in America have no net-equity. Reports talk about the high percentage of homes which are “under water” (that is, the value is less than the mortgage. However, for a home to have positive “net equity”, the value needs to exceed both the mortgage as well as anticipated selling costs. A handy rule-of-thumb in many markets is that a home needs to be valued around 110% of the mortgage for a seller just to break even on a sale. Worse, for there to be sufficient equity to “move up”, the home needs to be valued more like 120% to 130% of the mortgage. That simply doesn’t exist in most of America right now — trillions of dollars in paper equity disappeared over the past few years. Additionally, there is a huge overhang in shadow inventory. As I noted in a recent blog post, Americans are currently buying under 5 million homes per year (new plus re-sale) and in a healthy market, the inventory for sale is about a six-month supply. However, the shadow inventory alone is close to 6 million right now (and that doesn’t include “regular” homes on the market). Thus, we’re looking at a couple of years of absorption just to get the market back to some level of stability. Even THAT presumes that the home ownership rate will stabilize right where it is (it’s been falling precipitously for several years). Bottom line, I wouldn’t be betting on home construction any time in the near future. This is important for several reasons. First, home construction is a very big chunk of the economy. When homes aren’t getting built, lots of carpenters, plumbers, electricians, materials suppliers, real estate agents, bulldozer operators, bricklayers, and such don’t have work. Second, these are skills which are being lost to the economy. Further, if America is going to get the employment picture fixed, these people have to get back to work. Good news — such as it is — is that the HMI is trending upward, ever so slightly. It’s currently standing at 20, up from a bottom below 10 about 3 years ago (and a near-term bottom of about 15 earlier this year). It needs to bounce all the way back up in the 50 range if the leading-indicator relationship holds true for it to point toward a healthy housing market. It actually went that far in the 1991 – 1993, range, when it bounced from 20 to 70 in about 3 years. However, that was a market with pent-up demand, good values, and a healthier lending climate. Glad I found this! I know you are thinking it is some spambot but I seriously love this type of stuff. I write about similar issues but do not have the experience or background that you do. However, it is good to find a source of inspiration as it were…. I just noticed your blog roll and I’m going to check them out too. I already read The Angry Bear. With that out of the way, I really do not see new home construction taking off until it the last moment. I have heard predictions of a housing shortage in my state based upon predicted population growth from the last Census results. But I just do not see it happening. There is over 17 months of inventory in my MLS the last time I checked. In my area, it is still a long long way to being what I would call healthy. Good day and for what it is worth, I honestly appreciate your blog.